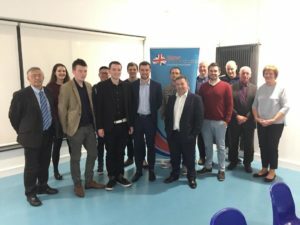 The Ards & North Down Ulster Young Unionists launched their new organisation on Friday 14 September 2018, and have urged other young unionists to join them. On Friday 14th September 2018, Ards and North Down Ulster Young Unionists was launched in Londonderry Park, Newtownards to grow support for the union and broaden its base in Ards and North Down through community involvement and outreach. Elected were Chairman Michael Palmer, Secretary Philip Agnew and Treasurer Bethany Ferris. Also in attendance were Ulster Unionist Leader Robin Swann MLA and Alan Chambers MLA; Group Leader Ald Ian Henry along with Ald Marion Smith, Cllrs Mark Brooks and David Chambers. Photo: Launch of Ards and North Down Ulster Young Unionists in Londonderry Park, Newtownards with (Left to Right) Alan Chambers MLA; Chairman Michael Palmer; Secretary Philip Agnew; Ulster Unionist Leader Robin Swann MLA; Cllrs David Chambers and Mark Brooks; Alds Ian Henry and Marion Smith.